It is highly recommended that students, family, faculty, and staff take the opportunity to celebrate this momentous accomplishment. The university holds a single commencement ceremony each June. Students must RSVP their intention to attend via MyOSU (under My Student Stuff, click Apply to Graduate). Detailed information is sent to the current mailing address of eligible students in April of each year. Oregon State University has a long-standing, proud tradition of providing each student with his or her own diploma at the commencement ceremony. Find out more details at the Commencement section of this site. 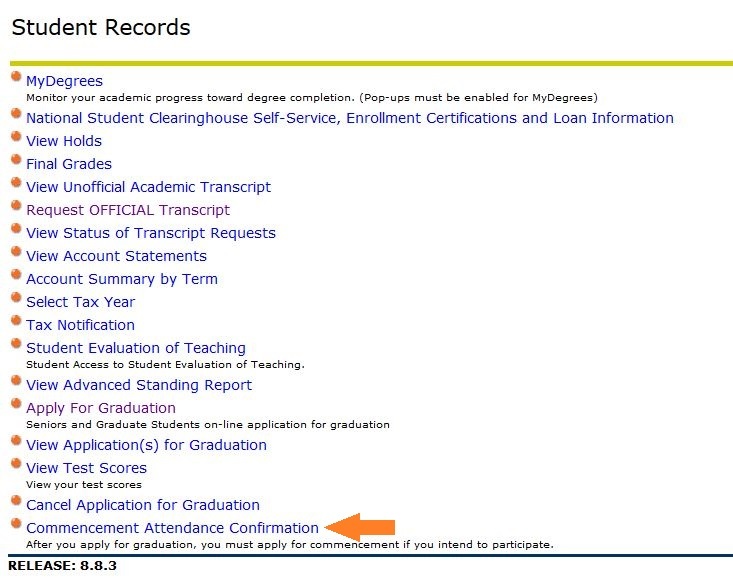 If you RSVPed for Commencement and no longer plan to attend, you may cancel your RSVP the same place where you noted you would attend (see image below). Students attending commencement may receive their diploma at the ceremony if the student is on track to meet all requirements. The student or their authorized designee may pickup their diploma at the Office of the Registrar. The Office of the Registrar may mail the diploma to the student upon receipt of a written request and the applicable shipping fee. For details visit the Diplomas section of this site.